ALL-ITEMS: The Statistical Institute of Belize’s latest statistics on consumer prices show that the All-Items Consumer Price Index (CPI) stood at 105 for the month of January 2018, an increase from 104.1 in January of 2017 (see Figure 1). This means that, for the first month of the year, the average Belizean household experienced a 0.9 percent rise in the cost of regularly purchased good and services compared to the same month of last year. TRANSPORT: During the month, consumer prices within the ‘Transport’ category recorded an overall increase of 5.6 percent. This was mainly attributed to higher prices in the ‘Fuel and Lubricants’ sub-category coupled with increases in the cost of various ‘Transport Services’. Within ‘Fuel and Lubricants’ the price per gallon of Premium gasoline rose 13.1 percent from $10.12 in January 2017 to $11.45 in January 2018, Regular gasoline rose 3.4 percent from $9.96 to $10.29, while the price per gallon of Diesel was up 9.7 percent from $9.12 to $10.00 (see Table 1). Among ‘Transport Services’, both international airfare prices as well as domestic bus fares were higher during January 2018, when compared to January of 2017. FOOD & NON-ALCOHOLIC BEVERAGES and ALCOHOLIC BEVERAGES: A marginal decline in ‘Food’ prices was the main cause of a 0.2 percent decrease in the ‘Food and Non-Alcoholic Beverages’ category. Several meat products, including ground beef, pork chops, whole chicken and pigtail, together with eggs and milk reported lower prices for the month of January 2018 in comparison to January 2017 (see Table1). A noticeable increase in the prices of some vegetables was also reported (See Table1); however, this was insufficient to offset the decreases seen among other food items. HOUSING, WATER, ELECTRICITY, GAS AND OTHER FUELS:The ‘Housing, Water, Electricity, Gas and Other Fuels’ category reported a 0.9 percent increase during the first month of 2018. This was due primarily to higher home rental costs along with a rise in the average price of Liquefied Petroleum Gas (LPG) for the month. The average cost of a 100-pound cylinder of LPG rose by 15.8 percent from $85.71 in January 2017 to $99.22 in January of 2018 (see Table 1). ALL OTHER CATEGORIES OF GOODS AND SERVICES:‘All Other Categories of Goods and Services’ together experienced a marginal overall decline of 0.1 percent for January 2018, reflecting the net effect of lower prices within ‘Recreation and Culture’ combined with higher prices for ‘Alcoholic Beverages, and Tobacco’. Lower night club admission fees for the month when compared to January of last year accounted for the decline in the former category, while higher beer prices were the main reason for the increase recorded in the latter. INFLATION BY MUNICIPALITY: With a reported 1.8 percent inflation rate, Punta Gorda Town experienced the highest increase in consumer prices for January 2018, mainly attributed to a higher than average increase in food prices within this municipality during the month. Meanwhile, the City of Belmopan, where home rental costs remained unchanged compared to last January, reported the country’s lowest inflation rate at 0.1 percent (see Figure 3). January 2018: Belize’s total imports for the month of January 2018 were valued at $144.2 million. This was an increase of 5.9 percent or nearly $8 million compared to imports for January 2017, which totaled $136.2 million (see Figure 1). The first month of the year saw a sizeable jump in the quantities of diesel, regular and premium fuels imported. As a result, the ‘Mineral Fuels and Lubricants’ category rose significantly by 64 percent or $8.1 million, from $12.5 million in January 2017 to $20.6 million in January 2018 (see Figure 2). An increase in spending on farming equipment, such as tractors and ploughs, along with telecommunications equipment drove the ‘Machinery and Transport Equipment’ category up by almost one-fourth or $6.3 million to $32.4 million for January of this year. Furthermore, goods destined for the ‘Export Processing Zones’ more than doubled compared to the same month last year, jumping from $1.8 million in January 2017 to $4.1 million in January 2018, with computer parts, oak and shrimp feed being among the items contributing to this increase. In contrast, imports meant for the ‘Commercial Free Zones’ dropped by $3.5 million, from $23.1 million in January 2017 to $19.6 million in January 2018, owing to lower imports of cigarettes, soups and other manufactured food items. The ‘Manufactured Goods’ category also saw a decline during the month, falling by $1.9 million from $19.6 million to $17.7 million, with decreases being recorded for goods such as aluminum/zinc steel coils and tires. Similarly, importation within the ‘Other Manufactures’ category declined by $1.6 million, from $13.9 million during last January to $12.3 million in January 2018, as Belize bought fewer laboratory plastics, prefabricated steel buildings and books during the month. The ‘Oils and Fats’ category fell by almost a half, from $2.3 million to $1.2 million, as the country imported less cooking oil in January of 2018 compared to the same month of 2017. 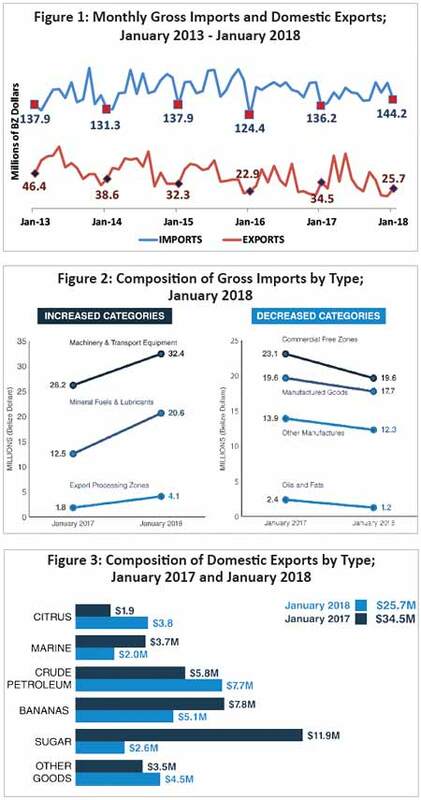 January 2018: Total domestic exports for January 2018 amounted to $25.7 million, down 25.5 percent or $8.8 million when compared to the $34.5 million recorded for January 2017 (see Figure 3). This marked reduction in total earnings from domestic exports was largely because only bagged sugar was exported in January 2018, while sugar exports for January 2017 included bulk sugar. For that reason, sugar revenues for the month were considerably lower than in January of last year, falling by $9.3 million from $11.9 million to $2.6 million. Likewise, banana exports declined notably in the first month of the year, as earnings from that commodity fell by over a third or $2.7 million, from $7.8 million in the first month of 2017 to $5.1 million in the same month of 2018. Sales of shrimp in January 2018 were markedly reduced when compared to that same month in 2017 and, as a result, exports of marine products fell from $3.7 million to $2.1 million for the month. On the other hand, the month saw considerable gains in crude petroleum earnings, boosted by higher world market prices for this commodity. Crude petroleum sales garnered a 34 percent increase in revenues, from $5.8 million in January 2017 to $7.7 million in January 2018 despite having virtually no change in the exported volumes. In addition, exports of citrus products performed positively at the commencement of the year, growing from $1.9 million in January of 2017 to $3.8 million in January 2018, with orange concentrate, grapefruit concentrate and grapefruit oil all recording strong sales during the month. As a result of lowered sales of sugar and bananas for the month, earnings from exports to the United Kingdom plunged by two-thirds or $12.1 million, from $18.1 million in January of last year to $6 million in January 2018. Exports to the CARICOM region, on the other hand, rose from $8.3 million to nearly $12 million, due to favourable sales of crude petroleum and orange concentrate for the month. Similarly, Belize saw increased earnings from Central America, as exports to this region grew from $0.4 million in January 2017 to $1.3 million in January 2018, due to improved sales of animal feed, orange concentrate and molasses.